Historically, it was rare to have an oven at home and food to be baked was brought to the baker to be placed in the oven. 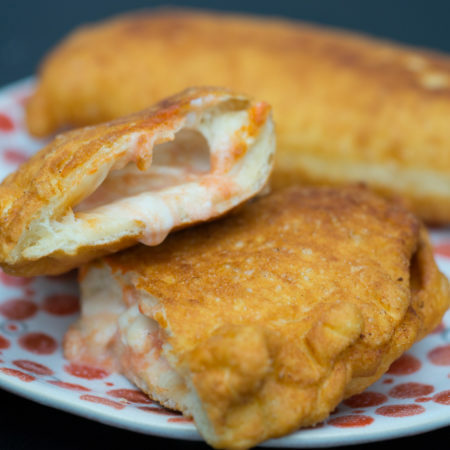 Everyone could deep-fry however, so fried pizza was more accessible than baked pizza. One only needs to see the inevitable crowd of people around a shop making panzarotti to witness its universal appeal. 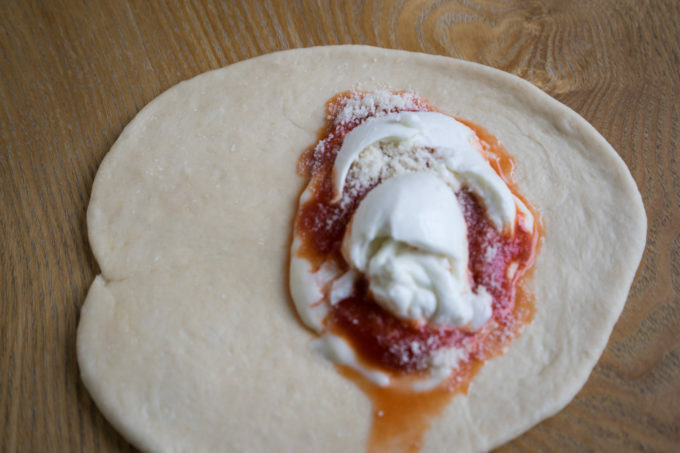 When a hot panzarotto, wrapped in paper, is placed in your waiting hand, it seems like an eternity until its molten filling is cool enough to not risk a scalded tongue. 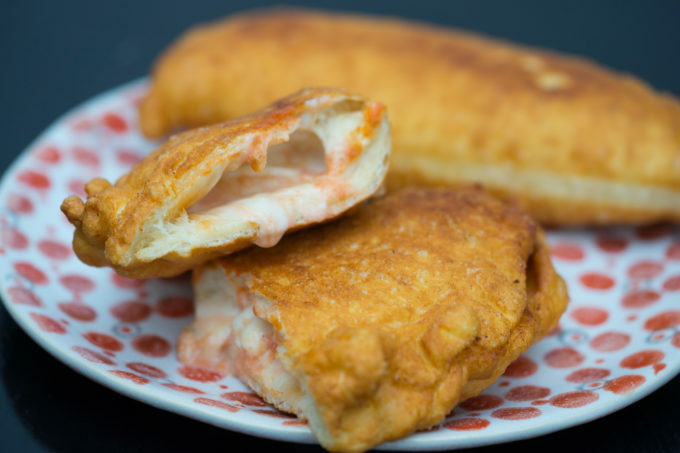 The fried dough on its own would be intoxicating enough but the tangy tomato and creamy, oozing cheese filling puts this snack at a completely different level. The filling proportions for this recipe were given to me by my chef friend, Emanuele, and produce a perfect creamy to tangy contrast. It is also perfectly acceptable to add ricotta or smoked provola cheeses, egg, parsley, salami or prosciutto to the filling. 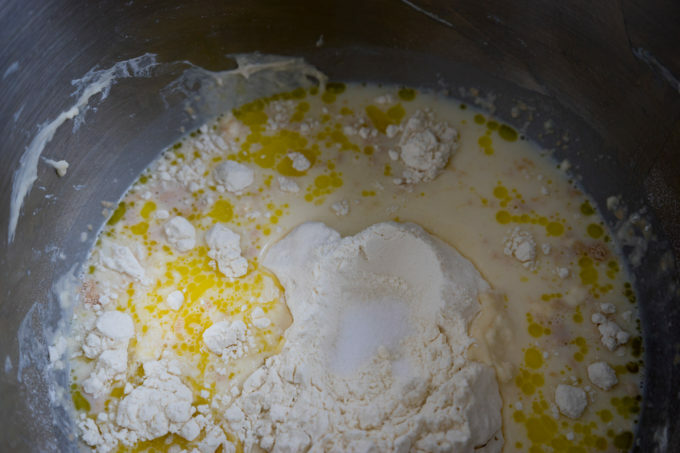 Mix the flour, milk, water, yeast, salt and olive oil together, being careful to keep the salt and yeast separate until well mixed. Form a ball and let sit covered in a bowl for 20 minutes. 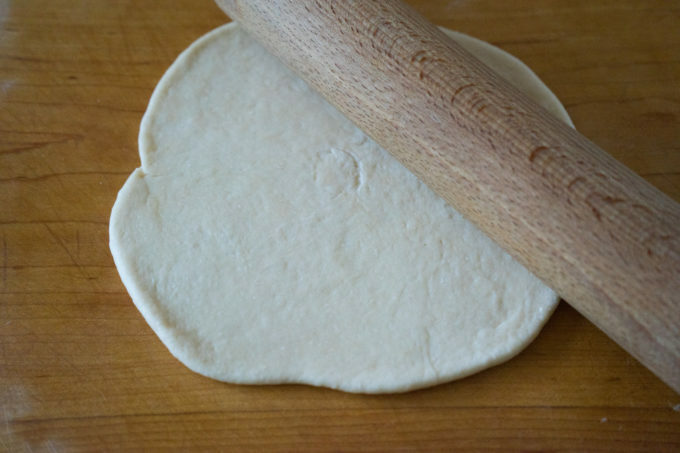 Turn the dough out on the greased surface and pull each side and fold it into the middle (see technique here). Turn the ball over onto the folded ends and place back in a bowl and cover for half an hour. Repeat pulling the sides again and place back in the bowl as before, covered for half an hour. 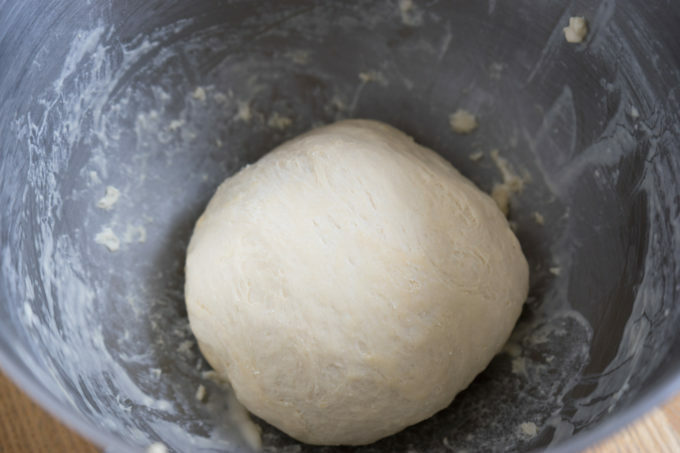 Divide the dough into 8 evenly sized pieces and roll out into rounds. Fill each round in the centre with 15 mls bechamel sauce, 15 mls tomato sauce, 15 grams mozzarella and 5 grams Parmigiano-Reggiano cheese. 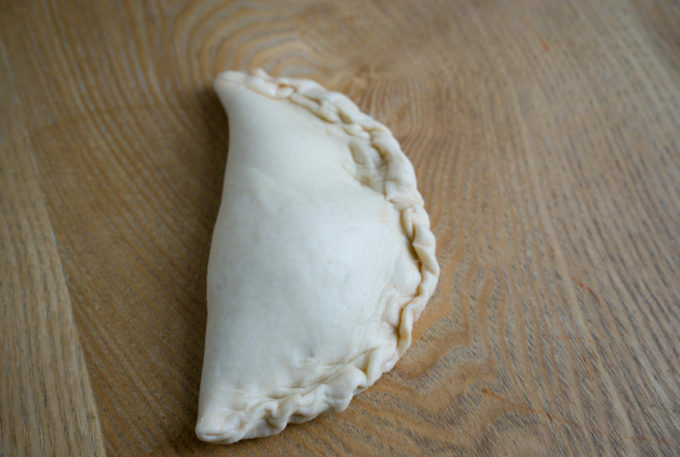 Fold the dough over and crimp the edges to form a crescent. Place some kitchen paper on a plate. 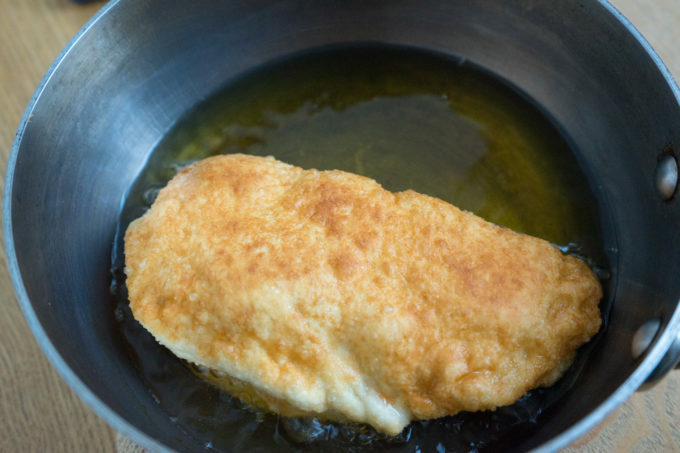 Heat olive oil or peanut oil to 180/190C. Add 1 or 2 at a time and cook for 1-2 minutes, until golden, turn over with a perforated spoon and cook for 1-2 more minutes. Remove with a perforated spoon and drain on kitchen paper. Repeat until all the dough is finished. When cool enough, eat immediately.